Hm, yes, Byron Bailey did start that one. Haven't seen him for a time. Well, three cheers to the latest odd items. I've plenty I might want to contribute to it. I have no clue what this is about, but it's definitely odd. Presumably the video was shot somewhere on this planet. Those are mockups of man-eating plants. Japanese block prints on the theme of Star Wars, executed in the traditional manner. Scroll down for large images. There are also photos of the wood engravers cutting the blocks. The website is in Japanese. Makuake appears to be a Japanese version of Kickstarter. It's no surprise that the limited edition prints are sold out. I doubt if many escaped from Japan. It seems strange enough seeing a world full of people glued to their smartphones. Things are about to get a whole lot stranger. This is very strange. The linked video shows what happens when random video noise is fed into Google pattern-matching software, and the resultant video output is repeatedly cycled back through the same software. You get recursion. Then the software begins to hallucinate. Something weird is going on here. I'm not quite sure what the implications might be for an Artificial Intelligence. A machine that dreams? Machine psychosis? A machine that lives within it's own virtual reality construct? Hey, I just posted about a bird phenomenon. Claimed it was SF-like. Maybe there's some relation seeing these two odd item posts. A cable series based on Lev Grossman's The Magicians fantasy trilogy is currently in production and scheduled to debut on the Syfy Channel in 2016. Here's a scene from the first episode. Extra points essay question: As the future arrives, do science fiction writers have more or less to write about? The essay question isn't hard: as the future arrives, science keeps pushing back the boundaries of what we know, and each new boundary represents new fictional opportunities. Sometimes science throws out the whole prevailing paradigm in favour of something radically different, and that too is fodder for fiction. I'm not sure what all is implied by the term "self-awareness." Self-awareness might be said to exist when a data processor is doing nothing more than collecting and responding to data about itself in addition to data having to do with its surrounding environment. The question that interests me is what self-awareness has to do with what is commonly called "inner experience." At what point is an inner light turned on? When is someone suddenly "at home?" My own thought is that this might happen at a very early stage. A housefly might have a tiny spark of that sort of inner light. The nature of the housefly experience would doubtless be utterly alien--a shifting, kaleidoscopic abstraction relating to changing sensory data about the outside world, with "inside" and "outside" hardly differentiated from each other--but a light nevertheless. If that's the case, and consciousness is a broad spectrum, the little robot in the video might be more than a doll-size automaton exhibiting a complexity of behavior that we tend to project our own imaginings on. As a society, we probably won't be able to sort this out at the rate technology will be pitching fastballs. A lot of people don't seem to be able to process the fact that animals aren't just empty biological machines. A lot of people don't even seem to be able to empathize with other people. I don't really know about the essay question. I can see the point about new knowledge opening new areas for speculation. On the other hand, it becomes harder to achieve a sense of wonder when technology is making so many wonders commonplace. I was born shortly after the Second World War. While there's no flying car in my driveway, my house is full of the science fictional wonders of my childhood. I fully expect to be talking with intelligent machines before I move on. Greg sez: "A lot of people don't seem to be able to process the fact that animals aren't just empty biological machines." I asts: Have you read Ted Chiang's latest, "The Great Silence"? A good story! It resonates with old memories. I spent two years on the island a long time ago. The Arecibo radio telescope installation was new then. It was impressive and not easy to get to. Sadly, I never had a close look at a parrot. I may have glimpsed one once, crossing a cloud-covered valley far below an observation tower in the El Yunque rain forest. It might have been a ghost parrot. Mt. Britton feels like a place where you might see ghosts. Interesting video. I really like the robotic staff manning the front desk. I'd be stuck checking in with the English-speaking velociraptor. It'll be fascinating to see what happens in coming months. This might just be another "cold fusion", or it might be a game changer. Or possibly something in between. Stay tuned! Apropos of nothing, it has taken Amazon Japan over 3 years to at last get a Look Inside preview of my story collection up. The electronic edition can be yours for a mere 100 yen. I'm curious how well or poorly English text might display on a Japanese language Kindle. I've had disturbing visions of my prose laid out in vertical columns of letters, possibly beginning with the last page and continuing on to the first. Glimpses of the future: a new kind of hate crime. 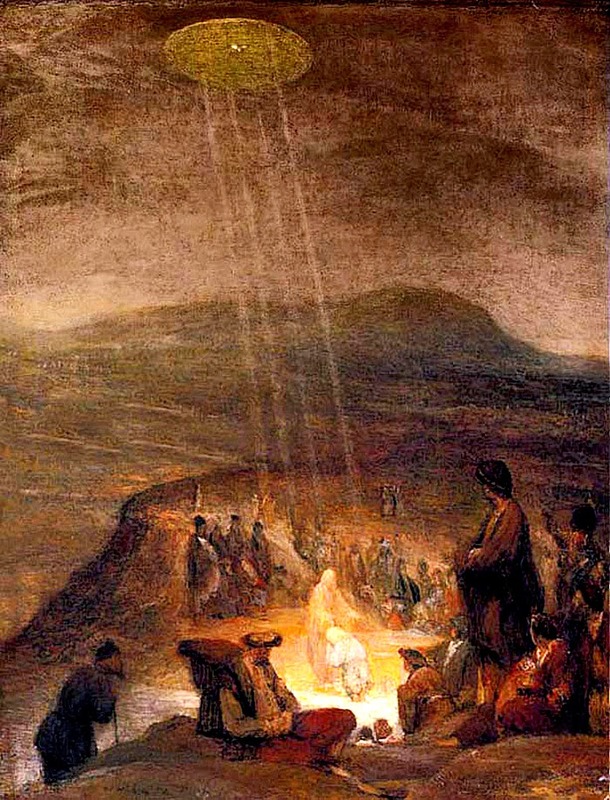 An Unidentified Flying Oddity: The Baptism of Christ, painted by Dutch artist Aert de Gelder around 1710. It's a first step but it lacks a zillion legs and a malicious intelligence. Maybe that's just as well. Imagine a world with a whole herd of Pratchett's luggage! I want about 100 of these things to follow me into battle. I haven't decided yet who or what to lead a charge against. Fascinating about the octopus genome (Yeah, I too have given up on figuring the plural!) Elsewhere I've read that the mother octopus does not long survive after her babies are hatched. This means there is no continuity from generation to generation of stories, technology, etc. Each generation has to reinvent the wheel, so to speak.